the environmental protection movement as we know and see it today was launched by sensible, rational people who had begun to discover early in the 1960s that the present pace of development, consumption as well as the type of technologies were destructive and unsustainable. Hence, there was a need to alter the patterns of consumption, improve technologies to make them less polluting, gradually shift to non-fossil fuels and set a new paradigm for development. In none of these have clerics, mullahs , rabbis, granthis and mahants had any great role to play. However, this is only one sidethe more important sideof the coin, which is that most human beings are religious in some measure. 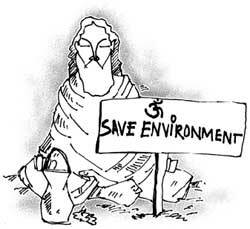 That means if the established religions were mobilised in the cause of environment, it would be easier for the environment protection movement to achieve its goal of a green, sustainable future. Religion being the source of much of the moral laws and ethos does have a way of colouring, inspiring and moderating human perception, decisions and actions. If religions lend their strength to the cause of the environment, a lot would be achieved. Also, there is enough of text and traditions in all major religions that encourage and sustain a conservationist ethic. The alliance between religion and conservation was forged in 1986 in Assissi (Italy) at a conference of religions in which five major faiths were represented. It had a great significance because Assisi is the birthplace of St Francis, a nature lover and conservationist. Later, in 1995, a Religion and Conservation Summit took place in Windsor under the inspiration of Britain's Prince Philip, international president of World Wide Fund for Nature. After that the World Bank convened a meeting of conservationists and senior religious leaders of nine faiths in London in 1998 to meet its directions. Leaders of the faiths also met with the World Bank president to discuss religion and development as a new factor in project assessment. This book contains the declarations of the religious leaders at the London meeting as well as supplementary material on the nine religions to explain their philosophy and worldview. It also has the United Nations Charter on Nature. The religions represented here are Baha'i, Buddhism, Christianity, Hinduism, Islam, Jainism, Judaism, Sikhism and Taoism. The religions offer noble thoughts and try to relate them to the massive conservation effort going on to change the tide of ecological destruction. The religion and conservation project is a facet of a larger interfaith dialogue going on today. This is a cause for hope because it tries to find common ground between religions to work for the common good and resolve conflicts of interests profitably and with minimum trouble. A perusal of the book shows that religions do have a vast area of common approaches and attitudes. There is a lot of scope for religious people to cooperate for the good of humanity across denominational barriers. Conservation is one such major area.